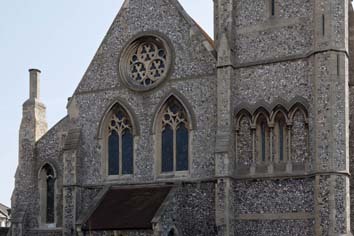 Though at first sight a typical mid-Victorian flint seaside church, the history of Christ Church is unexpectedly complicated. 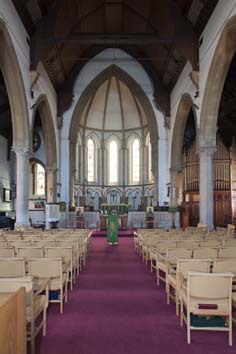 The nave was designed in 1859 by B Ferrey (BN 19 p213) as a chapelry of Holy Trinity (B 15 p553) and a parish was established in 1864 (Brown). 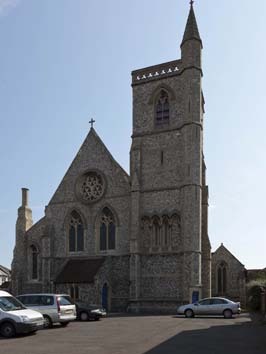 The flat-topped south west tower and south aisle were added in 1870 (ibid), but were part of the original design. 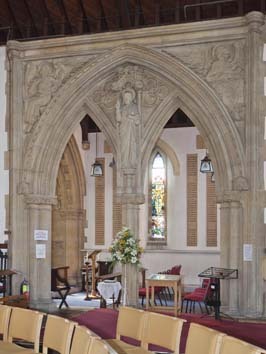 The combination of bar and plate tracery and the elaborate arcade, which has octagonal piers, are typical of Ferrey. In 1878 structural problems became apparent, especially with the roof (Brown) and it was decided to repair and complete the church. The task was given to E E Scott and R S Hyde (CDK 1880 pt 2 p163) and the sum of £4770 was spent (KD 1899). They added a north aisle, which matched the existing south one except for the arcade, which has round piers, and the roof, which lacks cusping. 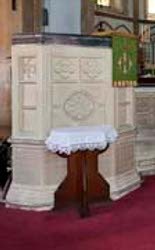 They also designed the five-sided apsidal chancel with tall lancets and vestries. Inside, it is vaulted and is decorated with wall-arcading and punctuated by shafts. Their chancel arch is also more elaborate. As the chancel is short, the sanctuary as built included the eastern half-bay of the nave, surrounded by a low stone wall. 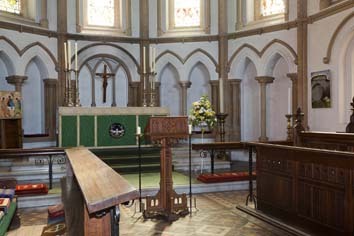 This incorporated the pulpit (now free-standing – see below) and since that is known to be by Scott and Hyde, theirs must have been the whole arrangement. A new porch was added at a cost of £140 by an unnamed architect in 1884 (CDK 1884 pt 2 p153). This is presumably the rather unimpressive lean-to at the west end. The next change was in 1921-22, when G H Shackle added a south chapel, immediately before his death (tablet in chapel). 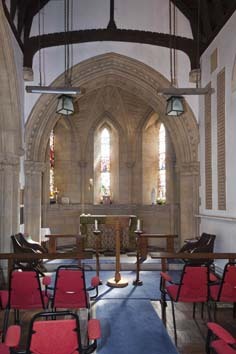 It is in the idiom of the chancel, with long lancets and a vaulted apse. It is entered through a double arch, elaborately carved with a figure of Christ in the spandrel. Perhaps unsurprisingly, Shackle had started his career as a stonemason, though he was not responsible for the carving here. There were repairs starting in 1962 by D Clarke and F E Ford of J D Clarke and Son (ICBS). 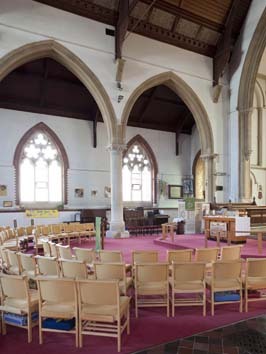 More recently, the church has been refitted which involved the removal of the dividing wall between nave and chancel, the installation of a nave altar and the replacement of the pews by chairs. Font: The bowl has four long sides with a knob of foliage at the centre of each, and four relatively short ones, all resting on squat, red marble shafts. It is all very much in the idiom of Ferrey. 1. (Main apse) Installed in stages between 1880 and 1884 by Clayton and Bell, five lights show the Te Deum, with medallions set in patterned glass, an old-fashioned motif by this date. The centre light was a memorial to Princess Alice, a daughter of Queen Victoria (B 38 p26). The church possesses a carefully annotated plan, apparently prepared by the makers, giving precise details of each light. 2. (North aisle east window) Jones and Willis, 1899. (The Good Shepherd/Prebendary Allen) (BN 76 p841). 3. (South chapel) Four lights with individual figures by E Woore, 1927-35 (DSGW 1939). 4. (South chapel, south and west windows) V Whall, 1928 and 1934 (DSGW 1949). 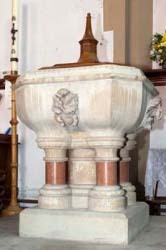 Pulpit: Caen stone by Scott and Hyde, 1879 (BN 37 p780). Reredos: Alabaster, also by Scott and Hyde of 1879 (ibid).